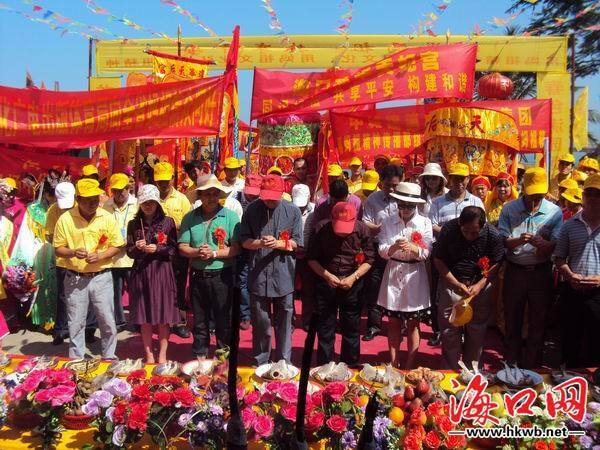 In celebration of the 1,052 anniversary of the birth of Mazu, a grand worship ceremony was kicked off in Xiuying District, Haikou on April 11. Series of activities including performers clad in traditional outfits, antique sacrificial ceremony, large-scale fishing boats parade on the sea and lion dancing performances took place in celebration of Mazu, who has been regarded as Goddess of the Sea of protecting fishermen and sailors. The festival has drawn a lot of local residents as well as Mazu worshippers on the first single day and will continue until April 13.